Synopsis: Devdutt Pattanaik, a renowned mythologist, digs deep into the rich symbolism of hindu mythology. Gives a new dimension to our belief system and growing up stories. Listening to/reading stories from the hindu mythology was a huge part of my growing up years. Whenever my grandmother used to visit us, she would tell bed time stories from the mahabharat, ramayan. 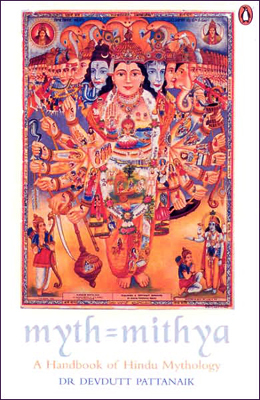 So reading Devdutt Pattanaik' mithya was like being transported to childhood. But there was a catch. The deeper hidden philosophy behind the stories and legends. And what an interesting read. Being a mythological fiction fan, getting my basics cleared felt good. Not only that, its really really interesting to read how our civilizations have progressed and our beliefs have been formatted so that we distinguish between culture and nature and respect both equally. Nevertheless just relishing the stories of Pandavas, krishna, ram-rajya, shiva felt refreshing. Though one problem I have is why doesn't the author go real deep into symbolism and instead keeps it superficial. And may be my answer lies here - mass targeting. If you are interested in comparative mythology, then this should be a part of your repertoire.